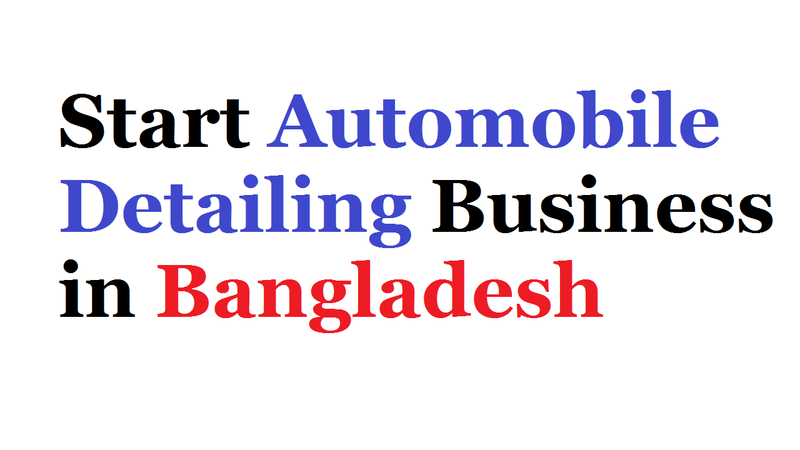 Learn step-by-step to start a car or automobile detailing business in Bangladesh. If you want to find a great way to earn a living and run a successful business, start an automobile detailing business in Bangladesh. Although it doesn’t require tons of training or up-front investment, it can help to get an expert perspective. Because you must notice how tough is the job market has become. As finding a job is very hard these days, there is another very efficient means of making a living becoming self-employed. It’s both on the outside and the inside is to detailing car about the comprehensive upkeep of the appearance of the vehicle. What you will do as a care detailer are vacuuming floors, giving windows a streak-free shine, cleaning stubborn stains, dirt, and bugs, and keeping the paint looking great and glossy. What is an Automobile Detailing Business in Bangladesh? Many of us are unknown about the term “auto denting”. This is the business where you’ll perform an extremely thorough cleaning, and applying a coat of wax to the exterior. It’s all about the careful attention to detail when cleaning, as well as the additional services. his is what the main difference between car washing and car detailing. Making it a great option for car enthusiasts to make money, you can charge more to detail specialty vehicles. You can earn money by washing cars at your home or the customer’s home with a car detailing business. Basically, you can do this job from any location because the business doesn’t necessarily require an ideal location. Focusing on providing an automobile detailing business for sports cars and high-value and luxury models is the businesses that turn a profit. The first step understands the industry and how to succeed when wondering how to start an automobile detailing business. So, you will need a proper place to work, the necessary chemicals and equipment, and a close attention to the details before starting your business. It’s more moderate than other businesses when it comes to the question of investment. That’s why you can start an auto detailing business with a smaller investment. As it’s said already that it’s important to plan out the operations of the company, develop a marketing and advertising plan, and focus on providing quality services before starting a business. What mostly you need to start an automobile detailing business is a good level of physical fitness, stamina, and the ability to work with hand tools, chemicals, and machines. It’s essential to get some training related to auto mechanic etc. although you may find it unnecessary, it helps a lot to have a bit of experience in how cars work and how to fix minor issues. Also, you need to know what car detailing involves apart from that. If you researched some more and polish your knowledge it would be better in automobile detailing business. But, it’s best that you have a vivid idea of what it comprises before you go into this line of work. As you’ll be standing, crouching, and bending very often, so know the physical requirements that are involved in this business. In addition, what you have to do most work with a variety of car cleaning supplies and power tools. You need not wait till you get a job while familiarizing yourself with car detailing and possibly getting some training. So, when you get a car, practice on it. Then, you can start detailing your friends’ or family members’ cars at first with free of cost. It means that the more you work, the more you get experience. But, make sure you’re confident before using harsh chemicals or power tools on other people’s vehicles. This is because practicing on your own car first is recommended. It’ll take time and patience, and of course, hard work to grow your venture into the best car detailing business in town. Before moving on to the next, you need to focus on getting great at one aspect of the detailing process. Rather than raking a step at a time, try to be great at all car detailing services at once. So, when you have not perfected cleaning the windows to a streak-free wipe and there you are, try to perfect your waxing skills. What the customer wants and provides them with just that is the first thing to do is know. If you want to do that then you have to visit other car detailing businesses and seeing what they offer. And describing where your business is located and the services you offer to make some posters and fix them on gas stations around town. Also, be sure to let the customers know if you have any offers. Moreover, it’s the internet, which is another important place for doing marketing, and it’s probably the best. So, describing clearly what it’s about, create a stunning website for the business. And if you want to be available when folks search for a car detailer in your area, we suggest hiring an SEO expert to do local SEO for you. Don’t stop learning when your automobile detailing business in Bangladesh is up and running. If you want to expand your knowledge, you can watch videos on YouTube on auto detailing. That’s a way that you can find some new, simple, and cost-effective ways of handling some of those detailing tasks.